First off I’d like to say congrats to Dallas Braden for pitching the 19th perfect game in MLB history. I can’t imagine how difficult it would be to retire 27 batters in a row. Braden is one of those players whose actual rookie cards contain the famous “Rookie Card” logo. Usually collectors treat “First Year” cards with more respect than the funky logo ones. But in this case Braden doesn’t have any “First Year” cards to go after. 2007 Upper Deck Exquisite Baseball has become a very popular product and I constantly catch collectors busting boxes online. 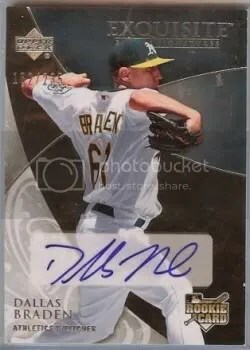 Having the chance of pulling a Lincecum or Braden signature, along with other popular rookies and veterans will only increase the demand of this product. ’07 UD Exquisite Baseball is one product Upper Deck did extremely well on. Braden’s perfect game will just add fuel to this popular brand. Now, go dig out your Dallas Braden cards!!!!!!!!!!!!!!!!!! Just dug through my ’07 rookie autos and sure enough there is a Braden Future stars auto. I should toss it up on ebay before the ferver dies down.